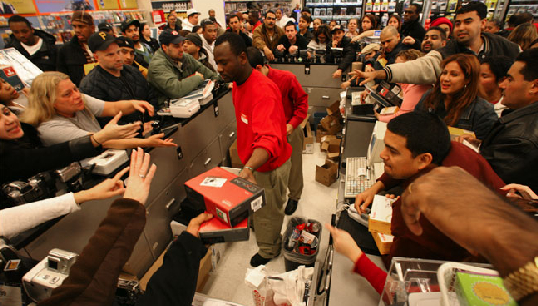 This weekend people will lose their minds, then behave poorly, over the opportunity to purchase inexpensively priced electronics, clothing, jewelry, and toys. As a result, you’re probably expecting to hear a pastor or a church leader say something abrasive about a “consumer mindset” or human greed. It’s not that people aren’t selfishly motivated to try to purchase their own satisfaction or that their ugly displays of entitlement don’t rankle my middle class sensibilities. I haven’t participated in the Black Friday feeding frenzy for nearly 9 years, but it isn’t because I’m taking a stand against something, or trying to make a point. I just don’t buy people televisions sets, digital cameras, or video game systems for Christmas. Which is interesting because if you look at the numbers in regards to consumer debt and bank card financing, neither do most of the other people who hit the stores early on Thanksgiving weekend in search of great deals. While they may not have the money, they are willing to risk their future by buying on credit because Christmas is coming. Christmas is the reason that they blow their budget. Christmas is the reason that they won’t be able to send their kid to college. Christmas is the resason that they decide to show their love for someone by purchasing them a… wait for it… Blu-Ray player or cell phone. Don’t get me wrong, if you love me and you want to give me a Blu-Ray Player or a waffle maker or 150 $1 dvd’s from Target, I am not going to stop you. Go ahead, wrap it up and send it my way. Just don’t pretend that it has anything to do with Jesus being born. This year my yuletide season isn’t going to be wasted on protesting the obvious and odious because I understand that it’s possible to buy someone an HDTV and still be a “good Christian” who didn’t trample someone in a parking lot or berate a customer service rep because their electronic hamster section didn’t meet your electronic hamster desires. We all know that it’s possible to participate in the buying of merchandise and not be a Christmas sellout in the same way it’s also possible to use Christmas as your excuse to “not let anybody down” or buy yourself that special treat that you so richly deserve. But why use the day that Jesus came to save the world as an excuse to give someone a gift that you can’t actually afford? Why use it as an excuse to hand someone something that actually keeps them from thinking about Jesus for the rest of HIS birthday? Why not save and spend your money on the people you love in an appropriate fashion on any other day of the year? You know that it’s possible to buy your kids a PS3 and give it to them on March 8th right? It is perfectly acceptable, and much more effective gentlemen, for your wife to recieve diamond earrings on say, a Thursday. You can buy your dad a bottle of Old Spice and a tie for Flag Day. Buying your loved ones a tangible, technologically complex, piece of entertainment equipment to celebrate the most supernaturally mystic event in history is as big a stretch as believing that watching Ke$ha sing about drunken partying actually has something to with female empowerment. And let Jesus be the reason for it all? When you treat your family right over the course of the year, Christmas doesn’t have to be an extravagant outlay of merchandise in an attempt to maintain fragile relationships. It gets to be a celebration of the Person who treated us right, even though we were greedy and consumer minded. That has everything to do with Jesus being born.